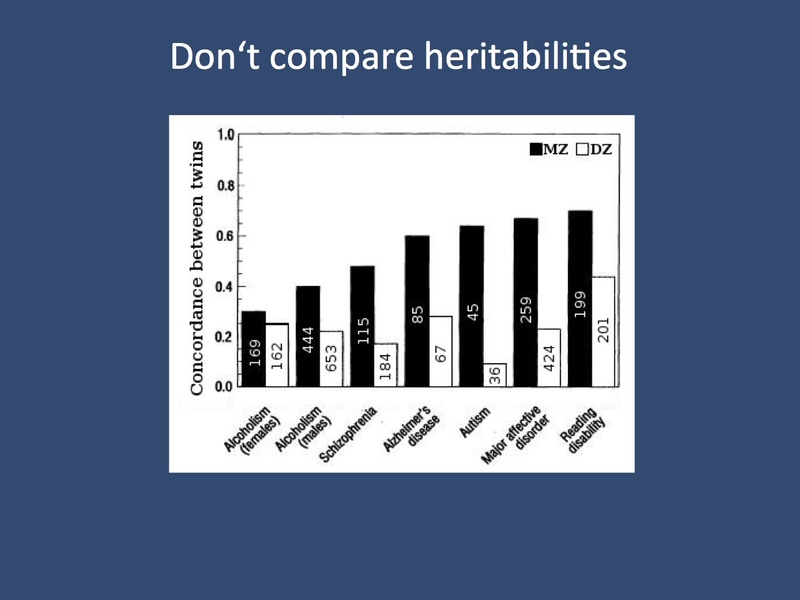 Should we stop talking about heritability in 2014? Genetic epidemiology. Long before the first epilepsy gene was discovered, clinicians and researchers were wondering about a genetic contribution to epilepsy. Some epilepsy syndrome were found to run in families in an autosomal dominant or recessive pattern. In other epilepsies, there was an obvious excess of affected family members in the immediate or extended family. And this is how we got stuck with the concept of heritability. Let’s review the perils and pitfalls of heritability and ask the question whether we should retire this concept in the current era of genomic medicine. Technicalities. The concept of heritability seems to offer the unique possibility to compress all we know about the genetic contribution of a disease into a single number. We can then use this number as an overall landmark for the strength of the underlying genetic contribution. For example, Childhood Absence Epilepsy has a heritability of 80% or higher, making this an essentially genetic disease. I used exactly this terminology in the past. …now take the first three sentences of this paragraph and delete them – they are simply not true and are based on a misperception of heritability and -more concerning- a faulty understanding of how genetic risk factors operate in the population as risk factors for epilepsies. Let’s take the concept of heritability apart. Heritability. The concept of heritability is probably the most misunderstood concept in clinical genetics and epilepsy genetics in particular. It is a term from population genetics that assesses the fraction of the variance of a quantitative phenotype attributable to genetic factors. The emphasis here is on “variance” and “quantitative phenotype”. Neither term makes immediate intuitive sense in the context of epilepsy – first, variance is term in probability theory describing the spread of measurements that is difficult to grasp, and secondly, epilepsy is not a quantitative phenotype. Population genetics gets around the second problem by hypothesizing a liability to epilepsy, which pushes individuals over the threshold to become affected. This way, heritability can be calculated from population studies using relative risk in relatives or concordance in twins. This gives us a point estimate as the often-quoted 80% in Idiopathic/Genetic Generalized Epilepsy (IGE/GGE). However, we usually forget three important caveats. This figure seems to indicate a clear message at first sight. Some conditions appear to be more “genetic” than others, suggesting that gene findings might be more likely in autism. For example, autism has a higher rate of concordance in monozygotic twins (mz) and a lower concordance rate for dizygotic twins (DZ) than schizophrenia. However, deducing that autism is more genetic than schizophrenia is not correct. Measures such as twin concordance and heritability are not easily translated into the probability to find genetic risk factors and their relevance. (Figure adapted from http://en.wikipedia.org/wiki/Heritability under a Creative Commons licence). 1 – Point estimates. First, heritability estimates are usually derived from relatively small numbers and the range of possible values compatible with this point estimate is usually not reported. For example, the confidence interval assessed in IGE/GGE is very likely compatible with values as low as 50%, indicating that on a population level, non-genetic factors might be as relevant as genetic factors. For example, a twin study for autism significantly corrected the heritability estimate for autism, citing small numbers in previous studies as the likely cause of the earlier higher estimate. Read our blog post about this here. 2 – Variability. Heritability estimates are usually obtained in a particular population at a given time and is not constant because of this. Depending on how variable genetic and environmental factors are at the point of time of the study, heritability estimates may change. For example, Febrile Seizures are known to have a heritability of 70%. This is only because pretty much every child has fever – if fever only affected a small subset of children, the population genetic contribution as assessed by the heritability would be much smaller. 3 – Heritability does not translate. The probability of finding causative genes does not necessarily correlate with heritability. In fact, in the era of genome-wide association studies, less heritable phenotypes were more likely to produce reproducible findings. From a study design point of view, heritabilty is a poor indicator for gene discovery success. For example, both IGE/GGE and TLE proved difficult when it came to identifying common genetic risk factors, even though both epilepsies are presumed to have significantly different heritabilities. This is why comparing heriabilities is a futile exercise (figure) – it has no implication on the chance of gene discovery or does not predict the underlying genetic architecture. Summary. Let’s stop talking about heritability and turn towards measures in genetic epidemiology that matter when counseling patients. The sib recurrence or offspring risk may carry more relevant information that the point estimate for heritability that has the tendency to misinform us about the contribution of genetic factors in various forms of epilepsy. This entry was posted in 2014, ILAE Genetics Commission, Opinion and tagged exome sequencing, genetic architecture, GWAS, heritability, liability threshold model, phantom heritability, twin concordance, variance. Bookmark the permalink.